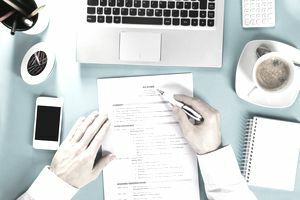 A chronological resume is one of the most common resume formats and there's a good reason for it: Employers tend to prefer it because it's straightforward and easy to scan. If you’ve never created a resume before, and you’re sitting down to build one from scratch, you probably have a chronological resume in mind. And while that might be the best choice for you, it’s worth learning what chronological resumes do well — and how to properly format one so that you can use this resume type to best advantage. A chronological resume lists your work history in order of date, with the most recent position at the top. It might include a resume objective or career summary before the list of work experiences. Note: It’s important to get the facts straight when you’re listing your work experience so that the employer won’t think that you’re lying on your resume should they decide to do a background check. Make sure that the dates, job titles, salary history (if included), etc. are accurate before you submit your resume and application. Education, certifications, and special skills follow work experience in this style of resume. The chronological resume is one of the most commonly used styles, and its familiarity alone makes the information easier to absorb. Ideally, it shows the progression of a career clearly. It can be easier to compile, too, since its orientation toward dates helps you to nail down the details of your own job history. As it emphasizes work history, the chronological resume is most effective for candidates with solid experience in the field. By showcasing your work history front and center, you immediately show the employer that you have related experience and skills. When you’re just beginning your career: The chronological resume format will not work well if you are new to the workforce. You may have all the skills required and applicable experience outside the realm of paid work, such as volunteering and internships. But if you choose a chronological resume, the hiring manager will only see your lack of paid work experience, not your abilities. In this case, a functional resume, which emphasizes skills over linear job experience, will help you make your case. When you’re changing careers: Many employers will put your resume in the “no” pile if they see that you do not have directly relevant work experience. Choose another style, such as a functional resume that focuses on your skills and experience or a combination resume, which lists both your skills and your work history. When you have gaps in your work history: Maybe you’ve been unemployed for a long period of time, or have taken time out of the workforce to care for young children or ailing family members. Regardless of why you’ve been out of the workforce, choosing a format that displays what you can do, rather than your work history, will help you make the best impression. When you’ve frequently changed jobs: Employee loyalty is a thing of the past, and for good reason: very few employers keep workers for the whole of their careers anymore. However, too many job changes can look bad to hiring managers, who don’t want to invest time and money training an employee who’s going to jump ship. If you have a history of job hopping, a chronological resume probably isn’t the best fit. Consider using a template to help you create your resume. Templates give you a ready-made layout and guide you through the process of filling it out. Resume examples can help you see what kind of content you should include in your document, and how you should write and format it. Administrative coordinator seeks management position with a top corporation that will allow her to utilize her organizational and leadership skills while coordinating workflow and overseeing company logistics. Highly organized individual able to handle and oversee multiple tasks simultaneously. Experience scheduling employee training classes, staff meetings, and office relocations. Have accurately managed a multimillion-dollar budget. Achieved 100 percent accuracy for the past two years. Oversaw research and design of sales and training presentations, requiring fluency in PowerPoint, SlideShare, and Prezi. Responsible for scheduling a three-person training staff. Responsible for balancing a $7 million facilities budget. Scheduled maintenance calls, staff meetings, office relocations, and construction projects. In charge of a 36-member staff, as well as a 7-member management team, with duties that included disciplinary actions, budgeting, special requests, program scheduling, and hiring. Chaired a committee that received a grant for increasing station amenities.